By LUDWIG VON KOOPA - Trayvon Tyson's Punch-Out!! brought to life. Spoiler alert, by the way. Okay, KoopaTV really did it this time. This isn't a game announcement. This is real life. The last and only time KoopaTV cited anything from TMZ, it was from an article heavily talking about Mike Tyson. TMZ returns again for Punch-Out!! shenanigans. If you'd like to throw your hat in the ring for the March 1 match, email fightgeorge@hotmail.com." We tried to interview George Zimmerman about his inspiration, but he declined to accept it. Fair enough. However, it's pretty obvious that he must've played Trayvon Tyson's Punch-Out!! and was frustrated that he was only an NPC. Feeling that he would never be able to have the same kind of success Little Mac had in the virtual world (for a comparison of Little Mac and George Zimmerman, click here), Zimmerman decided to do this in real life. Currently, ex-gang member "The Game" wishes to destroy Zimmerman. While the fact that Zimmerman was inspired by a videogame to do this and then the name of his opponent being "Game" is certainly interesting, KoopaTV wants Zimmerman to fight someone else. So we wrote to the National Action Network and MSNBC to draft the Reverend Al Sharpton. 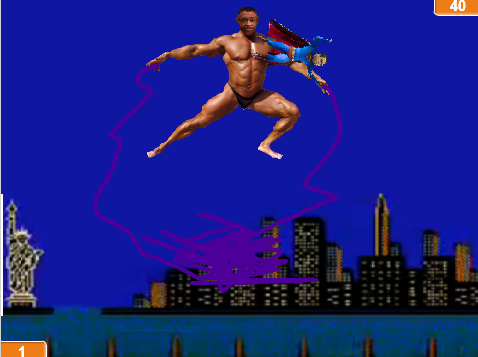 Zimmerman killed "Mad King Sharpnard" in Trayvon Tyson's Punch-Out! !, but what'll happen in real life? The two have some unfinished business? I'm Ludwig Von Koopa, and I represent the head of the media organization KoopaTV (koopatv.blogspot.com). I'd like to formally request that Al Sharpton fight George Zimmerman in a boxing match. (notably against CORE leader Roy Innis). NAN how much y'all would like to legally bring Zimmerman to justice. the Reverend Al Sharpton as the true representative leader of the black community. You can reply back to me at LudwigVKoopa(at)gmail(dot)com , but you really should be pursuing George Zimmerman and that hotmail address. Of course they haven't replied yet since I just sent that, but KoopaTV sincerely hopes that Trayvon Tyson's Punch-Out!! continues to reach new audiences. A real-life depiction of the events in the game would be absolutely amazing marketing and I'd be honoured. As for Zimmerman himself, since a core tenet of his defense case was that he couldn't land a punch, we're left wondering why he ever had this idea. Maybe he really is delusional after all? By the way, we have no idea who won against Roy Innis vs. Al Sharpton, but for Zimmerman's sake, let's hope it was Mr. Innis. Perhaps both are way out of Zimmerman's league. Regardless, just the very idea that something I made is influencing this man to do such ridiculous actions is really amazing. Ludwig will keep you updated on the Reverend's reply, and what will become of Zimmerman on March 1. He'll watch it closer than Yoshi's New Island! Zimmerman lives. Without a fight.